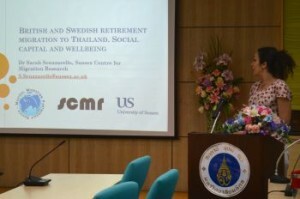 Dr Sarah Scuzzarello presents her recent research on “British and Swedish retirement migration to Thailand: social capital and wellbeing” at the IPSR, Mahidol University on January 12th, 2016. This study examines the growing, but so far little researched phenomenon, of British and Swedish retirement migration to Thailand. Retirees’ search for a ‘good life’ and wellbeing goes beyond material considerations. Theoretically, the study draws on social capital to examine how retirees’ ability to establish relationships and social networks with other expats and Thais in their society of settlement can potentially sustain their personal wellbeing. The research design compares the experiences of two sizeable retiree communities in Thailand, Brits and Swedes, who come from countries with distinct welfare and community traditions. The study aims to be one of the first to provide grounded empirical knowledge on European retirees, their wellbeing and life experiences in Thailand. In-depth analyses will be undertaken of retirees’ social media interactions on websites/chatrooms; their social capital and wellbeing (semi-structured interviews); and their expat community associations (ethnographic research and interviews).